‘You look forward to something to come home to after work and it’s a bit of an incentive to stay at work as well’. 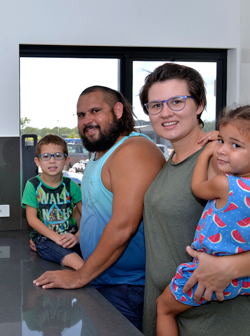 Home ownership always seemed an impossible dream for Darwin couple Edward and Sophie. But they were able to secure a loan with IBA and are now putting the finishing touches on their new home. The Indigenous Home Ownership Program facilitates Indigenous Australians into home ownership through providing access to affordable home loan finance. IBA’s target customers are those who can meet the long-term obligations associated with owning a home, but are unable to access home loan finance through the commercial home loan finance sector. 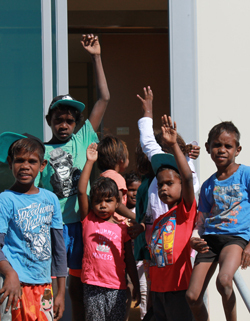 IBA also supports Indigenous Australians in remote communities to overcome the obstacles they experience in taking up home ownership, including, where applicable, by providing additional home ownership assistance for people who relocate to other areas to take up employment. More than 65,000 additional Indigenous households would need to move into home ownership to equal the wider Australian home ownership rate. The Indigenous population is growing at a faster rate than the non-Indigenous population, and is expected to increase by 60 per cent from 2011 to 2031. The number of new Indigenous home owners required to bridge the gap is likely to increase at a similar rate. IBA recognises that it has an increasing role to play. IBA regularly reviews its program policy and settings to ensure that they remain relevant to customers’ circumstances and the housing affordability issues facing first home buyers and support emerging opportunities to increase Indigenous home ownership. investigate potential enhanced models for credit provision, particularly by the private sector. 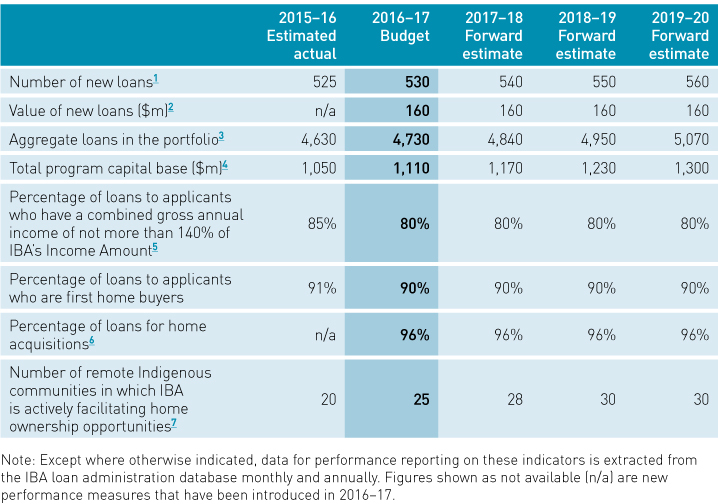 The indicators in Table 1 measure the success of the program overall in providing home loans and related assistance to Indigenous customers and effectively managing the loan portfolio. They also measure the success of the program in targeting lending and assistance to customers as appropriate to their circumstances and needs, and facilitating home ownership in remote Indigenous communities. ‘That’s when it went from me being an average Joe with a ute to buying machinery, hiring staff and so on’. 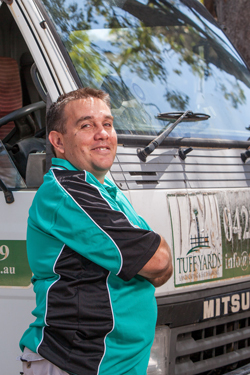 With assistance from IBA, Stephan is taking advantage of more opportunities than ever with his Tuff Yards landscaping and earthmoving business. In accordance with government and stakeholder expectations, the Business Development and Assistance Program operates as a national service to assist Indigenous Australians to start, acquire and grow viable businesses across Australia. The portfolio has historically financed a broad spread of businesses across the major geographic zones and industry sectors, and is weighted towards start-up small businesses. As the program has matured, IBA has increasingly needed to focus on the quality of its start-up support and ways to grow established businesses to generate long-term wealth and economic independence. Because IBA services emerging markets, its loan portfolio naturally carries higher risk than the portfolios of private sector banks. This further emphasises the need for IBA to focus on the quality of its decision-making and the support we put in place to ensure that businesses are moving along viable development pathways. In addition, opportunities in the Indigenous business sector have grown in recent years and, consequently, the service needs of the sector have become more diverse. 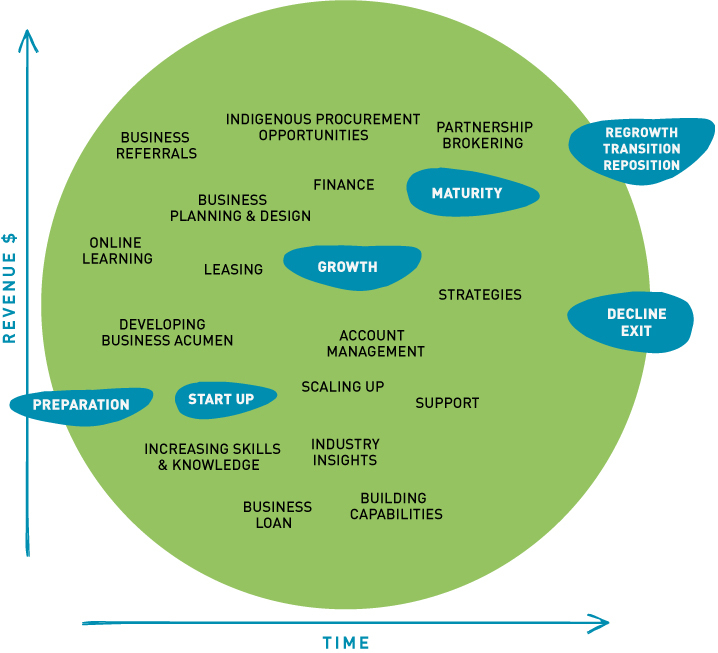 With these factors in mind, IBA is moving to transform the program in step with the growth of the Indigenous business sector. The program is being reorganised to broaden and deepen IBA’s capability to assist Indigenous businesses from start-up through to consolidation and growth. Figure 4 summarises the key elements of this process. IBA is also building a specific capability to support the growth and diversification of established businesses by assisting them to access supply chain and procurement opportunities. These initiatives will have the combined effect of mitigating portfolio risk and ensuring that the program is more effective in assisting the Indigenous business sector to grow. IBA will adopt a similarly holistic approach to customer needs, providing assistance across the business development life cycle, including the development of business proposals and risk management. Continued development and deployment of IBA’s customer relationship management system will enable a more customer-centric approach as well as routing of customer requirements to the relevant areas of expertise within IBA. focus the efforts of our frontline staff based in the regions on finding, developing and supporting Indigenous entrepreneurs as they look to establish and grow businesses. In the start-up stage of business in particular, IBA is shaping its services to better develop our customer base and create the best opportunities for success in business. Initiatives include conducting business information sessions, online learning modules, and educational workshops. IBA has developed a broad set of performance measures to cover its full range of business development activities. These are listed in Table 2. ‘With solar and with [population] numbers we were able to get services. We’ve got School of the Air now because we’ve got fifteen kids (back on country)’. Graeme Smith, CEO of Manungurra Aboriginal Corporation, Northern Territory. IBA purchased a solar system from Indigenous-owned business Allgrid and leased it to Manungurra, enabling two Aboriginal communities to stay on country. IBA identifies, develops, and participates in investment opportunities that promote economic independence for Indigenous Australians by building and managing a substantial portfolio of sustainable investments diversified by industry and geography. These investments collectively benefit Indigenous Australians through the generation of financial returns, commercial capability, employment, training, and supply chain opportunities. Typically, alongside Indigenous co-investors and other third parties, IBA invests through a range of companies and trusts. Subsidiaries’ accounts are consolidated into IBA’s accounts, and details concerning each investment are included in IBA’s annual report. IBA has developed a corporate governance framework and related policies which set out the governance expectations to which its investee businesses are subject. IBA appoints experienced nominee directors to the boards or governing bodies of investee businesses in order to ensure that they are managed prudently and in keeping with IBA’s corporate governance approach. IBA has historically had a relatively small investment customer base, reflecting its focus on bespoke joint ventures. Our current customers include land council subsidiaries, traditional owner groups, native title groups and Indigenous community/not-for-profit organisations. Almost 50 per cent of our existing customers are community/not-for-profit organisations. Responding to changes in the business environment, over the past two years IBA has broadened its engagement considerably in order to leverage its impact. In consultation with Indigenous groups and industry experts, we have been devising ways for IBA and its Indigenous co-investors to access more liquid and diverse asset classes, which will provide co-investment opportunities for a greater range of groups than has been previously possible. IBA has undertaken initiatives such as the establishment of the Indigenous Investment Principles working group, engagement by IBA’s Traditional Owner and Sustainability Unit, and the launch of pooled investment vehicles such as the Indigenous Prosperity Funds and the Indigenous Real Estate Investment Trust (I-REIT). These managed funds complement IBA’s other investment offerings, and enable it to support Indigenous groups to establish long-term investment portfolios. This in turn provides an economic base from which they can also partner with IBA to pursue direct investments, commercial property investment and local enterprise development. 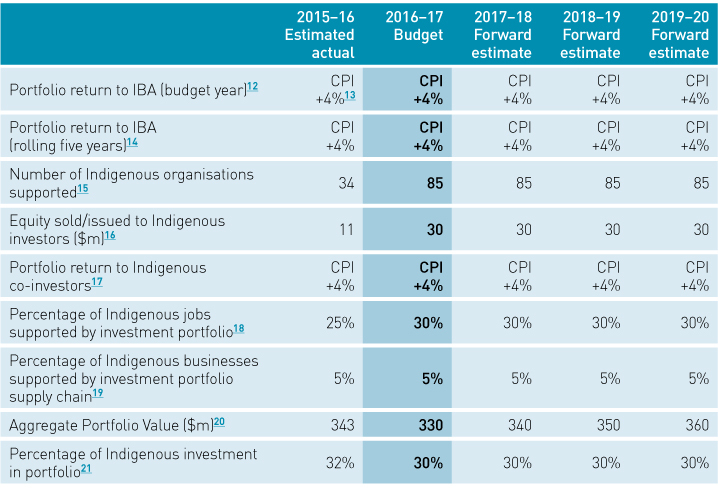 The revised strategy (for the three financial years from 1 July 2015) charts a path for appropriate asset allocation, target returns, acquisitions and divestments, which will establish the optimal asset allocation and economic impact for Indigenous Australians. by 30 June 2017, establish an Indigenous observership and leadership program across IBA’s investee businesses and ventures, to provide emerging Indigenous leaders with mentoring and practical experience in business management and strategy through IBA’s investment portfolio. 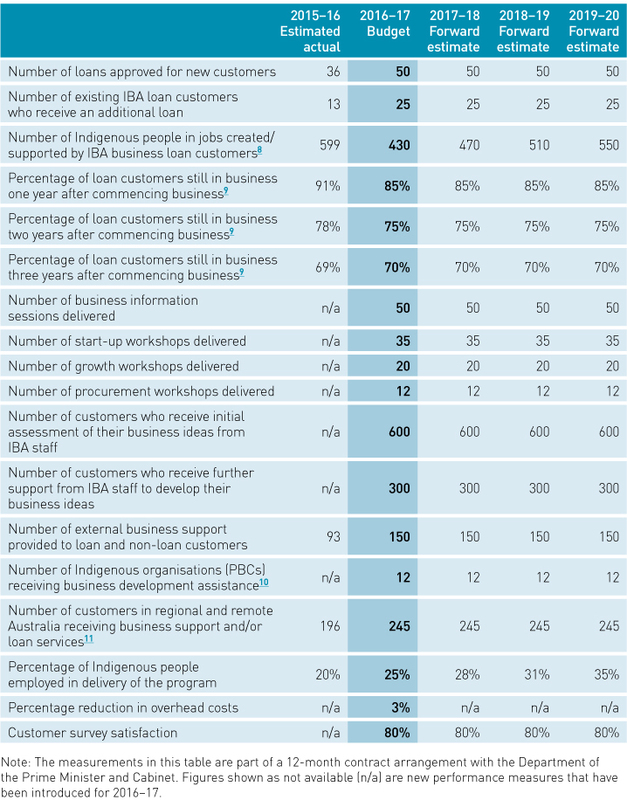 The indicators in Table 3 measure the program’s success in generating financial returns to both IBA and Indigenous co-investors, as well as broader contributions to Indigenous economic self-sufficiency through the creation of employment opportunities. Where relevant, the performance measures relate to IBA inclusive of its subsidiaries.